Thinking of Buying a Dog Water Dispenser? Find the perfect dispenser for each of these situations with our guidelines and recommendations. Find out about the health benefits for your dog of providing a dog water dispenser, how this could prove much more convenient for you as well as beneficial for your dog - and why I especially recommend the Drinkwell pet water fountain range. Dogs need few basics in life to keep them happy and healthy, a warm, safe, loving home and a nutritious diet are vital – but when it comes to water, we often fall short of what our pets need. Often we just place a bowl of water for our dog and leave it until it needs refilling. 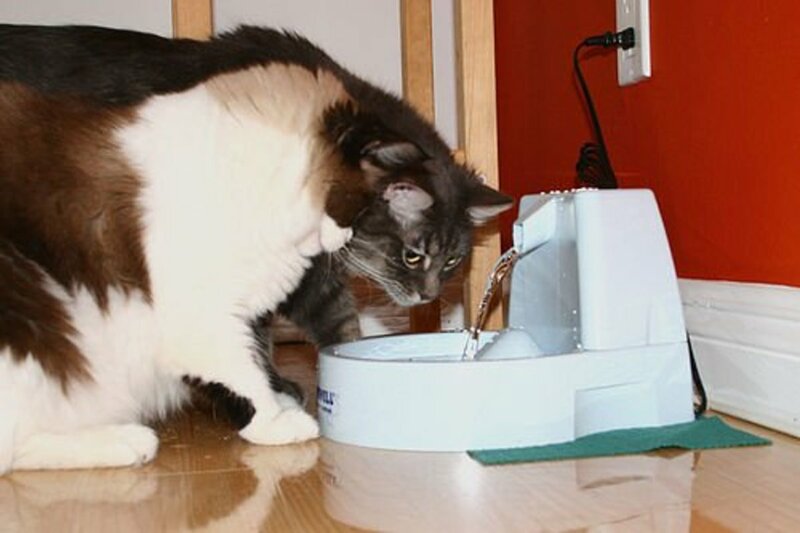 During this time, it can become stale and possibly contaminated, by using a water fountain, your pet has access to cool, clear, fresh water at all times to keep him hydrated and healthy. 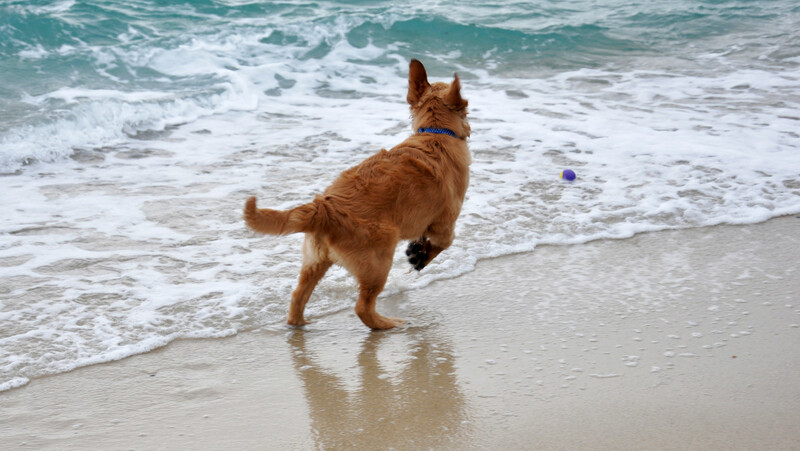 If your dog is pretty healthy and fit, he will normally monitor his own water intake, consuming anywhere between half an ounce and one ounce of water for every pound of his body weight, every day. So, my little Jack Russells, weighing around 15 lbs each, drink around three quarters of a pint a day in winter and a little more in summer, I keep a close eye on the older one, Murdoch, (who is now almost fifteen years old), as he has started drinking more recently and I am checking on when and how much he drinks so I can report to the Vet on this because over (or under) drinking can be a sign of a health problem – although in Murdoch’s case, he seems otherwise very well. Remember too, that water requirements will increase in warm weather and with increased activity. 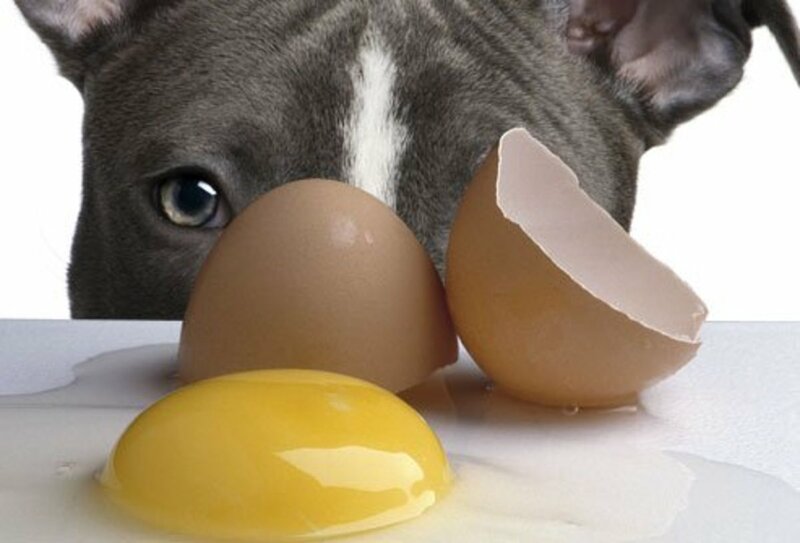 In addition, dogs fed on a dry diet will need considerably more water than dogs fed on fresh meat or canned dog food. The answer is that it mainly depends on the size and number of the dogs you have because water capacity is an important factor. There is no point having a dispenser to provide your dogs with fresh water all day long if it cannot hold enough water to supply this. 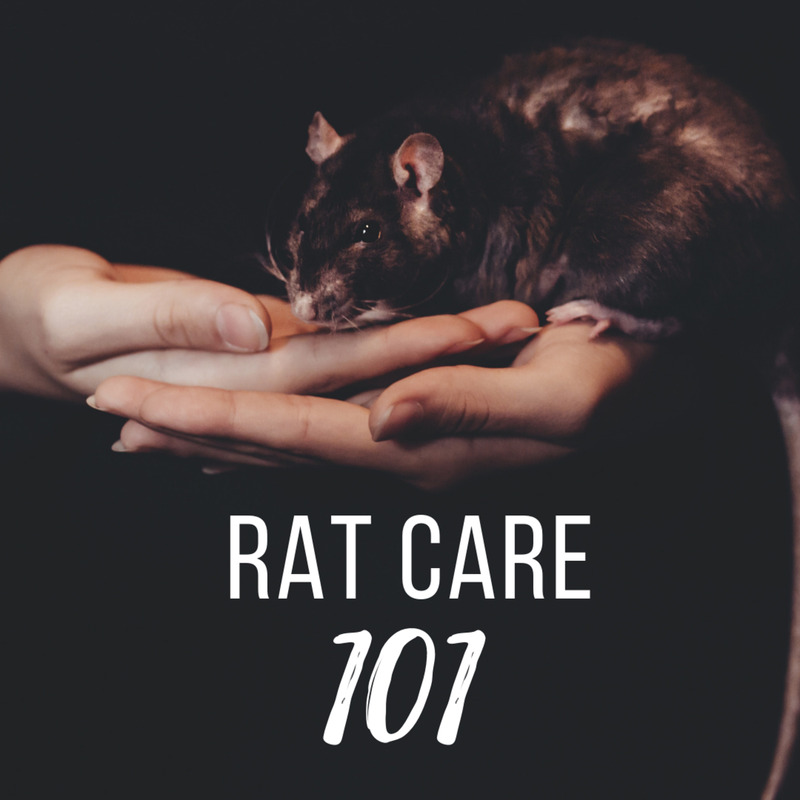 After taking into account the capacity, (remember, each dog will consume up to one fluid ounce of water per pound of body weight), ease of cleaning is the next big deciding factor. You need a model that is robust, made of an easy to clean, non-scratch material, which is easy to take apart for cleaning and for which, replacement filters are not only readily available, but also inexpensive. For large dogs or for households with more than one dog Choose the Drinkwell Big-Dog Fountain. This model is Veterinarian designed and holds more than two gallons of water. It scores top marks on all counts. It is easy to clean, the charcoal filters are readily available and keep the water tasting and smelling sweet and fresh and if it does not need refilling, no worries, the water will remain healthy and fresh tasting for your pet. 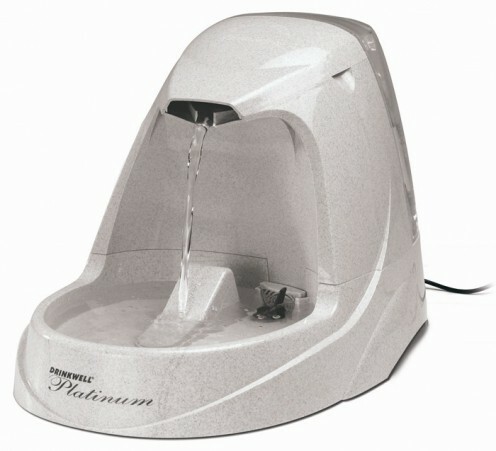 For smaller dogs or a single dog, I recommend the Drinkwell Platinum Pet Fountain. (Pictured below). This smaller capacity (168 ounces) pet fountain has all the same great benefits of the Big Dog model above. 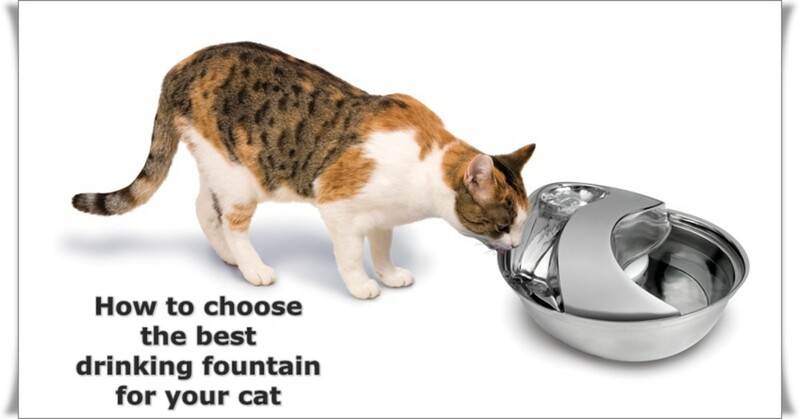 I choose Drinkwell pet fountains because they are so easy to care for and because the pump is very reliable and quiet in operation. Because it has to be indoors, in the kitchen, the sound is not intrusive for other members of the family either! 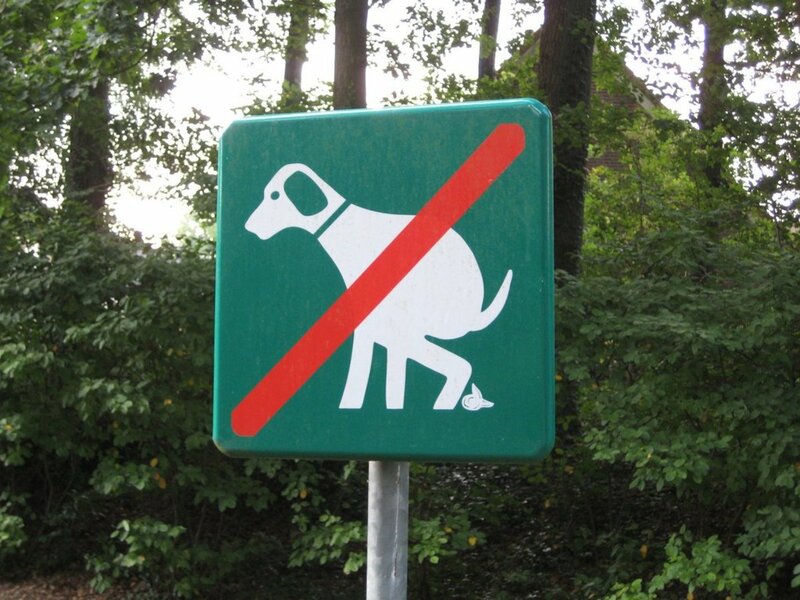 If you place water on the floor where your dog eats, he will normally have a drink after he has eaten and particles of his food will get into the water. Just imagine having a drink after your breakfast, leaving some water in the glass, then coming back to take a drink from the same glass which had been left in a warm kitchen all day, to find particles of your breakfast floating in it. You would throw it away wouldn’t you? It wouldn’t be safe, hygienic or palatable to even consider drinking it. Yet millions of pet owners put their dogs in this position and often the dog is thirsty and has no choice but to consume water that is really not healthy for him to drink. A dog drinking fountain providing running water that is constantly filtered removes these problems instantly and will provide your dog with fresh, running water whenever he needs it. This can also be a big advantage for fussy feeders who often need to be encouraged to drink an adequate amount. It can be especially beneficial for dogs who consume a mostly dry diet, for whom an adequate and constantly available supply of water is absolutely vital. If you don’t want to get a water dispenser, which solves the problem by continuously filtering the water, you should at the very least provide water in a hygienic, stainless steel or ceramic bowl that can be thoroughly cleansed by popping in the dishwasher or hot washing up water. Don’t choose plastic because it can become scratched and harbour bacteria in these scratches. Make sure you check whether your dog has had a drink after his meal and if so, pick up the water bowl, clean it and replenish it with fresh water. 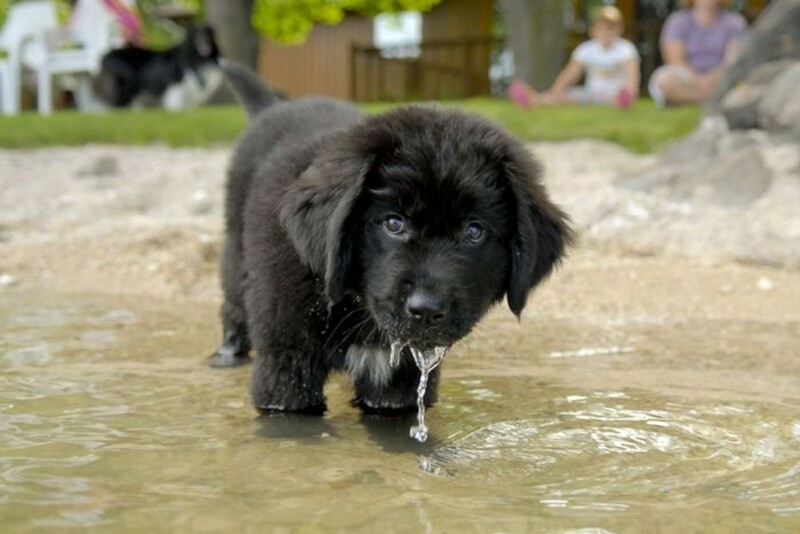 How Can You Check If Your Dog Is Dehydrated? Just gently catch hold of your dog’s skin at the back of his neck and stretch it like you were a Mom about to lift a puppy (don’t lift your dog, of course! ), by pulling the skin so that it stretches out and then letting go you can tell whether your dog is dehydrated. If the skin snaps back and returns to normal straight away when you let go, he is properly hydrated. 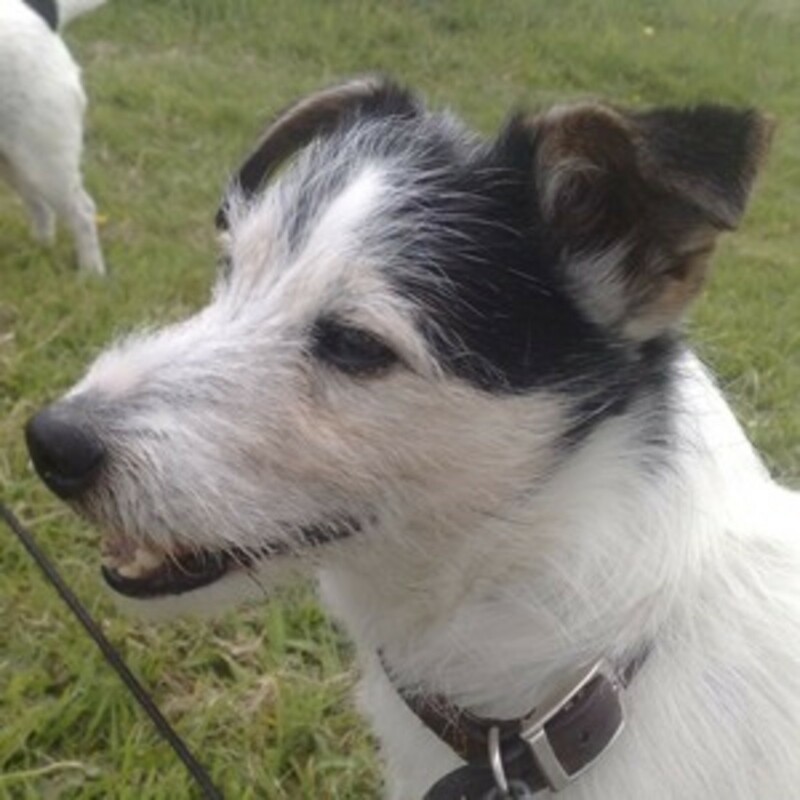 If the skin creeps back more slowly and you can still see a bit of a ridge, your dog is dehydrated. Another method is to check in his mouth. Do his gums look wet, if you run your finger tip across them, does your finger slide easily over the wet surface. If his gums appear ‘sticky’, he might well be dehydrated. After surgery or during illness, it might be necessary to provide your dog with broth or a flavored water to encourage him to drink so that dehydration can be prevented. 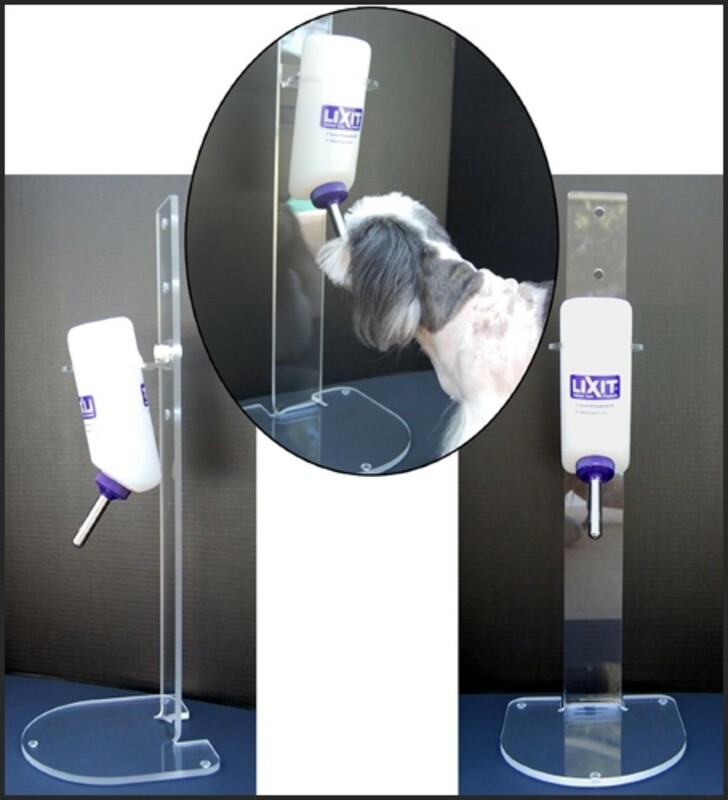 The bottle we recommend is the 44 ounce no drip water bottle from Lixit Animal Care (pictured). 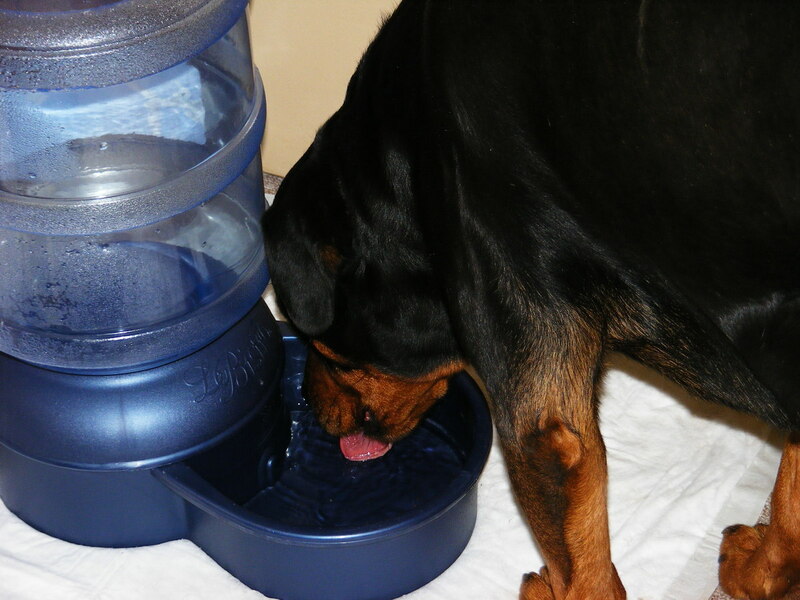 A dog water bottle can have several benefits when used as a water dispenser for your pet. It can provide owners with a very accurate way of knowing how much their dog is drinking for example which can be helpful if you suspect your dog may be under or over-drinking, both of which could be signs of a medical problem. If your dog needs to be in a crate or cage, perhaps after surgery or heartworm treatment or during illness, a dog water bottle fixed to the cage can provide fresh clean water as required. 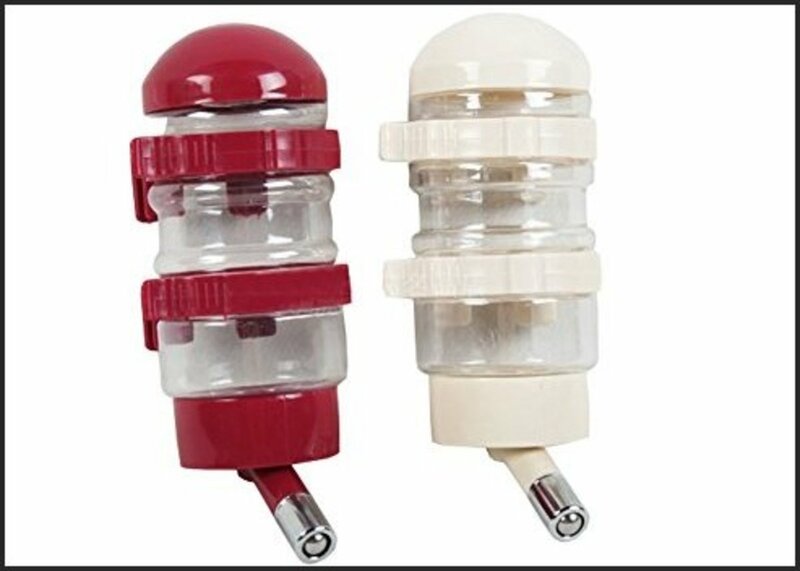 If you wish to use a dog water bottle instead of a water bowl or other water dispenser as the main source of drinking water, it would be good to have a permanent stand to affix the water bottle to. 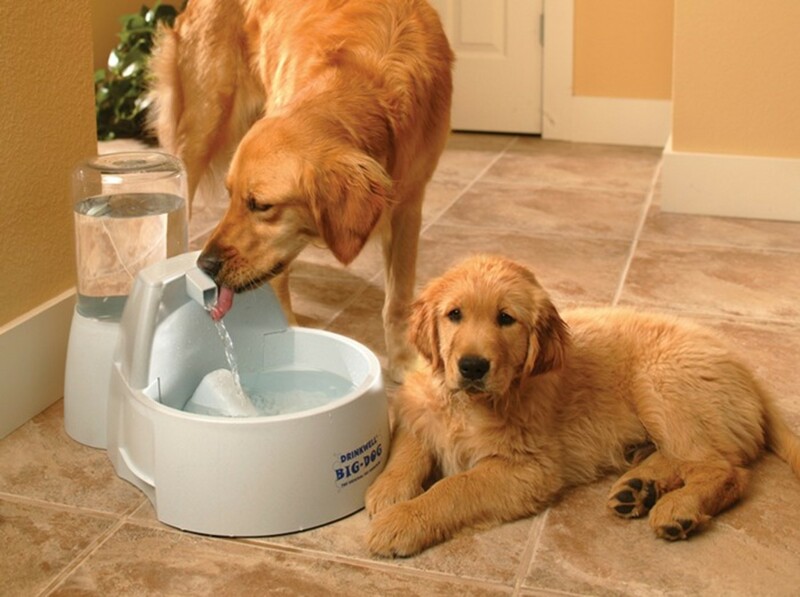 As a main source of water, this type of dispenser is more suited to smaller dogs and puppies. For larger dogs and for the convenience of less frequent refills, I would personally always choose the fountain type of dispenser. However, the bottle method is a great way of ensuring your dog always has clean water to drink as the contents cannot become contaminated with food particles. The Pet Oasis from Lixit (pictured below) is one of the best I have seen for smaller dogs, it is designed to hold a 32 ounce bottle (also available from Lixit). It is made from sturdy, easy to clean acrylic and has non slip pads for safety. You can adjust the height of the bottle position so it is brilliant for young puppies, right up to adult dogs of up to about 50 pounds in weight. When the dog has had a long walk or run and needs a drink, you need to ensure you have a supply of safe, clean, hygienic water with you so that he can quench his thirst. To avoid having to take a separate bowl with you to pour the water into, Gulpy water dispensers are brilliant (pictured below). The product is a bottle and a drinking container combined. 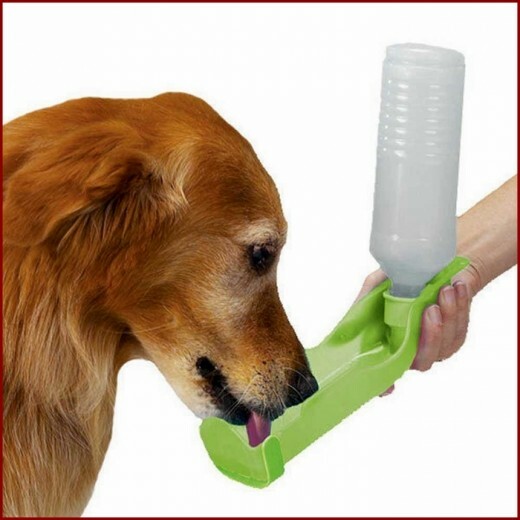 The drinking container can be folded down from around the bottle whenever your dog needs a drink. The bottle will clip onto your belt or into your bike water dispenser cage and comes in two sizes a 10 ounce or 20 ounce bottle. There are many different colors available too. I hope that I have managed to convince you of the health benefits for your dog(s) of using a water dispenser of a type suitable for the size, number of dogs and whether indoors, outdoors or on the go. Please let me know if you decide to buy a dog water dispenser or fountain for your pet!